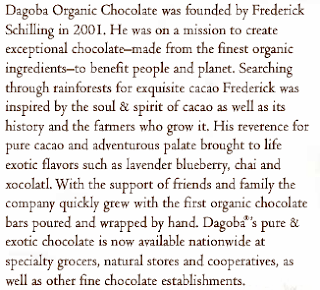 Hope's Cafe: Dagoba Organic Chocolate Review and Giveaway!! I don't know many people who don't like chocolate. I am one of those people that enjoys it in all forms. And yes, if I don't have any for a couple days, I start craving chocolate! 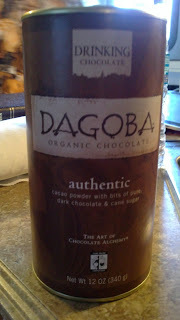 So, when I was offered some Dagoba Organic Chocolate products for review, I immediately accepted! Dagoba offers several different types of chocolate-from bars to baking chocolate-but I received some of their Drinking Chocolate mixes. There are 4 flavors-Chai, Authentic, Unsweetened and Xocolatl. The Authentic is my favorite...as a matter of fact, it is the BEST drinking chocolate I have ever tasted! Made with premium cacao powder and cane sugar, it has bits of dark chocolate that give an extra chocolate kick. Very rich, and very delicious! The Chai is, obviously, a blend of dark chocolate and ginger and chai. A very unique flavor that tastes great on cold mornings! I had never tasted spicy hot chocolate before trying the Xocolatl mix. This one is made with cacao, dark chocolate, chilies, and cinnamon. Again, not your normal hot cocoa flavor, but one that I enjoy when I want a change. The Unsweetened mix is full of rich, chocolatey flavor-without all the sugar! Great for someone who is on a diet, or limiting their sugar intake. I honestly wasn't sure how I would like this one, since I have a bit of a sweet tooth, but it is surprisingly good! One of my readers will win a package of all 4 Dagoba Organic Chocolate Drinking Mix flavors!! Go to Dagoba Chocolate and tell me another product you'd like!! 1 entry-Tell me your favorite way to indulge in chocolate-cookies, brownies, beverages, etc! This giveaway ends Wednesday, March 9, 2011, at 11:59 p.m. Please leave a valid email address in each comment, as this is how the winner will be notified. Winner will have 48 hours to respond, or another winner will be chosen. Giveaway open to US residents only. Disclaimer: I was not monetarily compensated in any way for this post. All thoughts and opinions are mine. 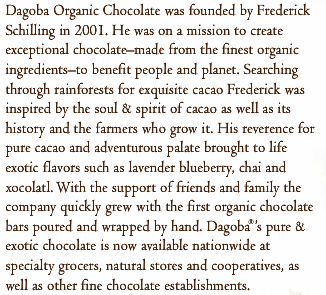 All quotes taken from the Dagoba Chocolate website. i'd love to try the eclipse bar! I would like to try the roseberry bar. I love M&Ms - could eat them every day! I would love to try the Dark Bar (59% Cacao)! The Milk Bar or Hazelnut Bar would be my choice. Please enter me. Thanks!